This entry was posted on March 7, 2009 at 1:31 pm and is filed under Corruption, Finance & Economics, Martial Law, Police State, Politics, The Federal Reserve. You can follow any responses to this entry through the RSS 2.0 feed. You can leave a response, or trackback from your own site. It is very sad that ordinary people are always the ones that get hurt. Big Government, Big Banks, Big Social Programs always get out of control. We in the United States are close to the top of the stairs leading to collapse and our government continues to spend, lie and tell us everything will get better. A march on Washington DC, one that makes the “Million Man March” look like a Sunday Picnic is needed NOW. We need to let the Congress know that we will not go into collapse without a fight. Throw them out of office, don’t believe the stories they weave, study history and realize spending isn’t going to solve anything. out of control? or planned chaos? either way you lose. “without a fight”–becareful of words from here on out. The author who composed these exemplary videos has correctly identified the international Banksters cartel as the source of what ails it as is the case with the entire world beholden to and enslaved by this international, multi-tentacled Leviathan, Now, let’s identify the collective identity of these timeless thieves/nation wreckers: It is organized Jewry/Zionism and it was originally spawned by the Rothschilds’ bankers and has now morphed into a metastasized cancer throughout the world. Wake up Americans’ from thy long, long slumber. This is what awaits you…! But what are my crimes then ? And fortune to fame ? A new “Boogeyman,” you’ve created, for your never ending fight. We’re not stupid as we once were, we’re not playin’ that game. For your “False War on Terror,” if I’m not mistaken ? Don’t bug me, or tap me, or enter my home. My bank balance, my credit cards, are not yours to view. Don’t go to my neighbors, my pastor, or bar. I have “God-Given,” rights, you’ve forgotten or missed. I didn’t give them up, & you’re now in my sights. I’m fed up, I’m pissed off, now I’m gettin’ my guns ! The lies that you’ve told, are now slipping away. So strike up the music ! And strike up the band ! This movement you’re afraid of, just in case it gets hot ? It’s just like the first one, & you just might get shot. But the case of “Impeachment,” was a horrible sight. I’ve come now to tell you, your time is now up ! You traitors, your tyrants, you sycophant scum. With an army of millions, for the whole world to see. To take back our country ! To take back our name ! To restore her to honor ! To undue her shame ! Others just vanish, we’ll not know their fates ? We will never give up now, we will not ever rest ! You will be brought to justice, you will hang for your crimes ! We will give no mercy, no quarter, no time. Like “Murder, Torture, & Treason,” are some. Do you get what I sayin’ now, do you hear my intention ? You made this my fight ! I didn’t even start it ! I was just livin’ my life, blind & half hearted. You wanted this “War,” so I hope you are happy ! I’m coming for you all now, so let’s make it snappy ! We will bury our dead & honor their graves. Cause like the cowards you are, you all ran & surrendered. Inspired by all those who came before us ! And the ghosts of Concorde 1775. Please feel free to reprint, copy, fax, e-mail & share with all. I wrote it for everyone. I’d like it to become “THE BATTLE CRY of The 2nd American Revolution !” Across the US. The # 1 Patriot Poem to strengthen & guide “US,” all. Argentina has been in decline since the early 20th century. What was once one of the richest countries in the world has since the time of Peron has been in a declining spiral. Basically due to political corruption. my mother in law always says that the best time she can remember was in the late 60’s under one of the last Military Governments before Peron’s last throw of the dice. The irony is that in the end Argenina’s main woes are self inflicted althoguh they love to blame the Seppos and the Poms. However even in the worst times the restaurants were still full. As for a causal link with the USA’s current probs no real comparisson except the greed issue. The USA just can’t match Argentina for corruption. Corruption is clearly a moral problem, yet we in the U.S. and Europe increasingly prefer liberty from moral constraints. To what end? Great post. However, this will never happen in America because the government will turn the military against us instantaneously. Also, we have the REX 84 program where FEMA has relocation camps set up all over the US in case of civil unrest. Supposedly, the camps are for a mass wave of refugees, but how can we be sure? And we have all sorts of executive orders in place where the President and Federal Government can seize basically anything they want if there is civil unrest or a major catastrophe. I know I sound like a conspiracy theorist with these posts, but how can we trust the Federal Government in a time of crisis? Look at the LA Riots. They moved in with Martial Law within 3 days. If there was massive civil unrest directed at the Federal Government and the collapse of our economy, they would swoop in immediately. The direction of this country for the last century has been leading up to this moment. The Federal Reserve has manipulated our economy and devalued the dollar by 80% and limitless power has been transferred to Washington. A violent revolt or civil unrest is not going to work. We need to educate every American about the Constitution and the views of our Founding Fathers. Then slowly, neighborhood by neighborhood, district by district, state by state, we can restore the vision of the framers of the Constitution. Thanks again for the post. Very informative and eye-opening. Hi “chazfh” – give us a chance, our politicians are really trying to catch-up! 1.5 Trillion (unofficially) in 3 months is a pretty good start. The main reason we have public debt is because Alexander Hamilton knew a way to get the rich and elite behind the government was to sell them bonds. That way they needed the government in order to get paid. We also have all sorts of “corporate welfare” programs that use taxpayer dollars to fund and subsidize industries that have strong lobbying power. That is just legalized corruption. Look at our utilities. Every one is a monopoly allowed by the state. I know the whole Enron fiasco is an argument for regulation and I agree with that. But the reason we haven’t had any advances in alternative energy or other forms of fuel is because the utilities have no competition. The only reason they are changing now is that the governments are requiring it. We could have clean coal and solar power and wind energy by now, but instead the utilities just milked the current system. The railroads in the mid 1800’s are another great example of the industry giants wanting regulation to eliminate their competition. Government action created railroad monopolies and set the prices they could charge. Honestly, if the American public was as passionate and cared about the Constitution, what happened in Argentina would be happening right now. Instead, we are resigned to inflation, big business, corporate welfare and the wasteful spending of our tax dollars as part of the way of life. GREAT WORK! MAY I ADD TO IT PLEASE. MUCH OF THE FOLLOWING WAS COPIED, AND SOME IS MY OWN. THE IMPORTANT THING IS THIS; IT NEEDS TO BE PASSED ON. As you read, keep this first statement in mind. President James A. Garfield said, “Whoever controls the volume of money in any country is absolute master of all industry and commerce.”Let’s begin. Why the world wide economic melt down? There’s no doubt we’re headed for a one world money system, but sometimes to understand the present and the future we need only to study the past. It’s an age old problem; money. An adequate supply of money is indispensable to civilized society. We can forgo many things, but without money all things will basically grind to a halt. Remove money or even reduce the supply below that which is necessary to carry on current levels of trade, and the results are catastrophic. In 1930 America did not lack industrial capacity, fertile farmland, skilled and willing workers, or industrious farm families. It had an extensive and highly efficient transportation system in railroads, road networks, and inland and ocean waterways. Communications between regions and localities were the best in the world, and we had a well-operated government mail system. Yet the United States of America in 1930 lacked only one thing: an adequate supply of money to carry on trade and commerce. Bankers, the source of America’s money and credit, had deliberately withheld $8 billion from circulation by refusing loans to able and growing industries, stores, and farmers. At the same time they demanded payment on existing loans so that money was rapidly taken out of circulation and was not replaced. America was slammed into the Great Depression. This was no accident! It was orchestrated. Our depression lasted until 1939, when the U.S. Government began to spend large amounts of money into circulation for our military. WWII was on. As soon as the money supply went up people were hired, farms sold their produce, mines reopened, factories began to hum, and the Great Depression was over. A lack of money in circulation caused the Depression, and an adequate amount put back into circulation ended it. So why all of a sudden was there plenty of money to loan to our own government, but none for private business? We must remember: our Constitution under Article I says, “Congress shall have the power to coin money and regulate the value thereof.” Yet in 1913 with many members of Congress away for the Christmas holidays, Congress passed the Federal Reserve Act bringing the Federal Reserve Corporation to birth. This is a privately owned banking corporation, which has the right to print and loan money to governments and you. With interest applied! So they control the flow of money. Money is created out of nothing! It is only paper, ink, and numbers. Sometimes its only numbers, as it is sent from computer to computer. Now you tell me; who controls the volume of money in America? So that brings us to our conclusion. This recession, which is fast headed to a depression world wide, has been orchestrated also! Money has deliberately been taken out of circulation. Obama did not win this election. He was placed into the White House for the purpose of destroying America. He was not born an American, he was born in Kenya, and is indeed a muslim. If powerful men in high places will not remove him from office, the American people just might do it for them. It wouldn’t hurt to remove a large number of them also. You obviously haven’t read SHOCK DOCTRINE, by Naomi Klein. She outlines in detail HOW and WHY this all happened in Argentina, and HOW and WHY it is now happening in the U.S.
Want to get really angry and frightened? It’s spelled out for all to see. This is not conspiracy theory. It’s documented history. Compost your organic food waste, add rock dust, microbials, & pray! It will not be any different this time around, and probably much worse. People need to learn how to survive a depression. Thanks for the parallel illustration. Unfortunately, Mark Twain’s comment, “Suppose you were an idiot and suppose you were a member of Congress. But I repeat myself,” reminds us that the ones who are supposed to be watching the store are either eating all the inventory or pocketing all the profits. When those responsible for oversight become an oversight, then anarchy prevails. The similarities are just shocking! What’s never mentioned is that an alternative solution exists… the government should force the banks to put an end to credit contraction or face the abolition of the FED and the fractional reserve system, replacing it by governmen’t issued CURRENCY (as American constitution DICTATES)… the only thing that will stop these guys is the fear to lose the power they have to counterfeit money legally! The destruction of the Great American Empire is imminent as we shall go into the antichrist beast system which will enslave the whole Earth and have those who don’t know Jesus and those who are weak Christians take the coming Mark of the Beast Chip!! And that tiny chip which they will put in peoples forehead or hand will make them their zombie brained slaves!! But don’t worry; the Great God of Heaven will defeat them all after they have killed and martyred Gods True Children who refuse their beast chip!! And Jesus will send His Great Plagues upon them and they will have 42 months of hell on the Earth and then Jesus will return and defeat them and their lord lucifer and his fallen angels and all those who were the children of the beast and who took their Chip!! in favor of the monied class are proof they can’t be trusted. If their mouths are moving, they are lieing. corruption and public looting we’ve seen. it out on those responsible, and not those who were also ripped off. Coming from Cuba where WTSHTF has lasted for over 46 years I know what will happen here in the US and how to get ready. First thing that I did was to move out of CA and into the woods of OR……..at this time I have food for 7 years and all that I would need to survive for another 30. The reason for the above is that no matter what you do there is always something else to do. Great info! would you like to cross link? Well, as an Argentine, I can tell yo you are wrong. 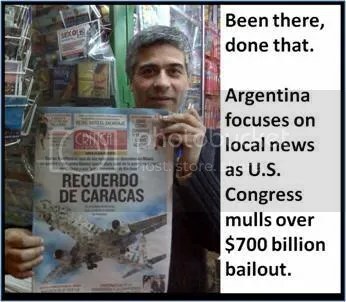 The primary problem in Argentina is massive nation-wide corruption at every level of the government, from the police officer to the president….Debt has always been a problem for Latin America, since the 1800s actually…….The parallel is a very very poor one. THe 2001 economic collapse was also a currency collapse, where the peso and the dollar were unpegged….In the end, Argentina has been economically much stronger since then….but I don’t think that will be the case with the U.S.
Also, having family still living there, I can tell you Argentina is doing pretty ok. I was just there in December. There is no major crime-wave or things falling apart….Its kind of business as usual…. I didn’t get to see all the videos. But, it is important to point out, if it hasn’t been already, that a lot of people point to Menem’s leadership (not de la Rua’s as the reason for the 2001 collapse). Argentina was ‘in bed’ so to speak, with the United States and their peso was pegged to our dollar. It was a false exchange I suppose, built on false growth and capital hope. The result would not look similar to the chaos that ensured in Buenos Aires, because Americans are not similar culturally and citizens have guns. Also, Im curious about what was mentioned above as far as the FEMA and military spectacles they have planned to keep us at bay. What I could see as far as “cacerolazos” “tumultos” lo que sean, riots would break down some racial and class-related barriers. I love the Americas and I hope that our failures can soon make us stronger. Great that somebody else is now bringing these facts to light. Our organization has been laying the foundations to help this NOT happen here in the US. Argentina had to revert back to the barter system in order to rebound. Just like computers, sometimes you just have to reboot the system! Americans are still pretty much in the dark or in denial. They still think that the Big ‘O’ is gonna save them. They don’t know that he is working for the same people that are causing this collapse! I for one can’t see “Americans” uniting in force as they did in Argentina unless things got significantly worse than they are now. Our socialist leader hasn’t been in office more than 2 months and still has a lot of support, although losing it quickly, and the rampant poverty portrayed in the videos hasn’t happened here yet. Should that happen, unemployment continue rising, inflation rising, then maybe. Can anyone see liberals/conservatives/et al protesting in the streets daily in the US? Clashing with Obama’s proposed civilian army? Is Voir Dire serious for blaming the Jews for the banking crisis? Does she really think we have that much power and influence? If she really believed we had a quarter of the influence she ascribed to us she wouldn’t open her mouth in fear we’d have her evicted from her home. Jewish banking in the Middle Ages was the only thing that moved the economy along since the Church wouldn’t soil their hands with usury. It’s sad that ridiculous stereotypes still get passed along and that sometimes people who espouse them actually get taken seriously. May I share this w/ folks not part of wordpress? Thank you for sharing it here! do you get my e-mail address? Rabbieric is obviously a pro-Zionist Jew — just the people behind all of this global crap from the beginning. It’s time we stop listening to these people. I’ve also been told that Israel has purchased massive amounts of land in the Patagonia, and a B&B Inn said they see constant Israeli “backpackers” going thru for unknown reasons. These SOB’s are always up to something and expect us to trust them since they are the “eternal victims.” I’m sick of it. LOL at a Jew getting mad about criminal Jewish banking practices. A massive march on the Capitol is needed, but I doubt it will happen. of confusion and diversionary tactics. poured into the very firms which caused the problems. continue to implode, as will law and order. Yes there are parallels and yes this is all scary but as I am living in Argentina and come from an Argentine family (but grew up in the States) I just need to post and say that you all should maybe read back further than the history of the 1990´s in Argentina before you start jumping to conclusions. Our collective memory and theirs are not the same, to say the least. We have commonalities but Argentina is a different kind of nation and will continue to be until some major and incredible changes take place. And yes, Patagonia is full to the brim with young Israeli backpackers. They outnumber any other cultural group on the travel circuit. will implode, financially, lawfully, morally. With nothing left to lose, a formidable foe is born. Didn’t Argentina steal all the 401K’s in the name of saving them? Their Marxist leader stole everyone’s savings because she said there were too many fraudulent investors out there,, so to “protect the people from theft” she stole their savings and just put it into the budget, then made a bunch of low paying “government work ” jobs for the people she had just stolen money from,, using their money to create the jobs. Don’t you just love communism??! Democrats are talking about doing the same thing here. This is why it’s so important that we keep control of our guns, so the government cannot overpower us. I am dead serious, RabbiEric, and I know EXACTLY what I’m talking about, and so too now do tens of thousands of our intellectuals/patriots who are doing everything in their collective power to disseminate the truths about what the perennial nation-wreckers have been doing to the Western nations for a very long time. Your people, with few exceptions, are simply incapable of telling the truth about anything nor criticizing your own no matter the degree of depravity or wickedness. Nevertheless, nice to see that at least you own up to the Jews’ being responsible for the (forbidden by Christianity and Islam for very good reasons) practice of usury against others. Why don’t you share with this audience, Rabbi, what your racist, hateful holiest book, the “Talmud” has to say about the practice of usury and cheating of Gentiles (all other people other than this self-anointed group of “God’s Chosen People”)? That cheating, murdering and stealing from other groups of people is not only acceptable, but advocated? And that ALL other people inhabiting this planet except for you Special Ones’ are equated with lowly cattle and thus expendable at Jewish convenience or whim. The truth about how the Jewish bankers unconstitutionally captured control of our monetary policy in the U.S. in 1913 and then a direct hand into our pockets with the Income Tax Amendment (never properly ratified) has become common knowledge. And we intend to increase exponentially that understanding to as many others as possible. Excellent blog you have, thank you for sharing it with us. Seems there is every likelihood of a global recession, already on its way over here also. Jct: I’ve done 24 videos on how Argentina used community currencies as economic lifeboats to weather their financial storm. We can follow their example. MIchael L you are spot on that is exactly what happened and is happening. US Congress is a rubber stamp! Their is no gold in Ft Knox or the IMF! Americas will now suffer the very same fate – Will the Americans take it lying down like the passive servants they have proven themselves to be over the years? Or will their gun ownership deliver them from evil? The Church teaches them to “turn the other cheek”, to accept misery as they are all sinners – The Church convinces them to accept their corrupt environment without question! The Catholic population has been convinced that in the name of god it is their duty to suffer like Jesus; &, to die on the cross of injustice like their savior! Christianity is an anti-nature death-cult that preaches all men are sinners cast out from heaven! Americans have lost all but no 3 of their Bill of Rights – Yet they say & do nothing! People deserve the government they get! The USA & Argentina have all the information they need to prosecute corrupt politicians, bankers & corporate leaders – YET THEY ALL CHOOSE NOT TO PROSECUTE! People have the government they deserve! Wow, powerful videos. It’s the end of days, there are harsh times coming everywhere. Be prepared and get ready, get right with God, it’s going to be terrible. criminals, enemies of liberty, and enemies of the people. nation to lawful, constitutional footing. Yeah, right. The military would desert back to their families. You conspiracy loons with your beliefs that Jews control the world, soldiers have no independent thoughts and a conspiracy of officers orchestrated Sep 11 are just pathetic. If such a conspiracy really existed, they wouldn’t bother pretending to have elections, and you’d already be in concentration camps. Then I’d shoot a few tranzis, because someone has to deal with the problem. The good news is that this does not have to happen in America! The bad news is that Americans need to wake up and do simple math. To employ 5 million americans at 30k per year takes 150 billion. To stop all foreclosures takes 1mill*1k*12months or 12 billion. So for 162 billion dollars the US government could stop all foreclosures and put everyone in America back to work! Instead we let AIG STEAL 180 billion dollars! Instead we let CITI STEAL over 60 billion dollars! It is time every America demand that money be spent only to put people back to work and keep every American in there home period! You can do this by sending emails and phone calls to every US representative and senator and the president. If every American would do this then maybe we would not have to march on Washington and demand this done! We could also threaten to put everybody in jail for this massive theft! But it is now up to Americans to understand the simple math and forget about left vs right and republican vs democrat and demand jobs and staying in there homes. The LIE is now out in the open and it is up to everyone to say it in the light of day! The tarp is a lie, the bailouts are all lies, the government is stealing the money from the people and giving it to the corporations who are funding all the politicians. At the same time Americans are being thrown out of there homes and losing there jobs! Again forget about left vs right or the republican vs democrat, that is all a media head fake. Just do math and common sense. How hard is it to line up jet passenger plane with a building and not be too low to hit other buildings and not be too high to miss it and be within 50 feet dead center. Answer odds are over 1 in a million. Now do this with 2 planes. conclusion: automatic pilot is the only way this could have been done. Building has structural damage that is made of steel and concrete. The structural damage is from burning jet fuel and impact. The building is over 1000 feet tall and the impact is over the half way mark in altitude. What is the probability that the building will fall within a 100 ft radius of the original building footprint? Add a second building doing the same thing? Add a third building housing all the government cases agaist stock market and banking theft existing and pending investigations. Answer with 2 planes hitting 2 buildings it is not only is impossible but not even worthy of asking the question how did three buildings fall within 100 ft of there existing footprints completely every floor perfectly to the ground! Conclusion, demolision explosions were the only way possible to do this with current technology. Three buildings going to ground within there footprint was actually remarkable and impossibly accurate. So I am not going to argue who did it or why. Wake up America do simple math with common sense! Two planes hitting two buildings with pilots who both had no actual flight experience and leveling 3 buildings is not only impossible but completly intellectually unbelievable!!!!!!!!!!!!!!!!!!!!!!!!! the situation is same as in my country Indonesia, in 1998…when the riot happened in big cities..unemployment, hunger, and other disaster was happened by that time..
Great post sir! Never knew about this event! There are so many accounts in history of repression and successful revolution. It’s almost as if all of history were a recount of the same tragic tale, yet in the end, humanity prevails. well,… were not that bad currently. the crisis has affected us all, but after 2001 weve been experiencing one of the highest economic grows of the world, only behind china i think, althoug the reasons you mention as causes for the 2001 crisis are correct, at least in my opinion. I remember hearing about this in 2001, I remember the stories about corrupt politicians, and fraudulent banking institutions. I agree if we dont watch it we will be facing the same faith. A socialist or any collective form of government will eventually breed corruption and will have a major impact on the economy. The only moral economic system is Capitalism as it respects the individual, property and the fruits of his labor. I spent two years in Argentina from Jan 02 to Jan 04. The collapse there was devastating! It was a rarity, in some places, to find people that even had work. That’s what socialism gets you. That’s where we’re heading in the USA if we don’t change course and reverse some of Obama Messiah’s decisions! if you did not concede the control of your county to Jewish lobbies , you would have a much better life! I have a cousin who lived in Argentina. She described the exact same scenario as the videos did. Whoever thinks this can’t happen in America, is in some serious denial…only I think, if it happens here, it will be much worse. The Argentine situation was very, VERY different then ours currently is. If you want to say that shoddy banking and corruption are bad and lead to economic catastrophes say that. But there situation was way different. They fixed their currency to the American dollar and it was extremely over valued after a decade as a result. Also, politicians were actively driving the economy into the ground to facilitate a return to power. It is kind of irresponsible to compare these two situations and scare people. Read “The Creature From Jekyll Island” by G. Edward Griffin. Also ask yourself why the Federal Reserve (which is no more Federal than “Federal Express” and has no “reserves” quit publishing the M3 statistics in March of 2006. Why did Timothy Geithner, who was head of the New York Fed during the housing & derivatives bubbles get “awarded” the job of Secretary of the US Treasury? He should be in jail, along with Greenspan, Bernanke, et al. Hell, even Bernie Madoff doesn’t have to sit in jail. It is a wonder he wasn’t given a cabinet position! You don’t need my “irresponsible” blog posts to scare you – go research the truth for yourself; that should rock your world. As I made clear, the situation in Argentina and the situation in America is *not* identical. However, the forces that control world finance are the same, and the outcome for the US, like Argentina, will not be good for the people. Your right, Americans do everything to excess, so why should we think the level of economic turmoil be any different? There is no international banking conspiracy and all that Rothschild drama people seem to be quoting all the time (especially those swept away by the Zeitgeist movie claims). What happened in the US was reckless, feckless interference by politicians on the left who forced banks to lend to people who couldn’t afford it and who also made people who couldn’t afford it feel they deserved it anyway. These were packaged up as completely gold star, backed mortgages and sold off as such around the world. Then everyone found out that they were fraudulent and the gig was up, for buyers, lenders, banks and foreign/domestic investors who owned chunks of the toxic waste. But it’s just the latest bubble. George Bush came into office after the dotcom bubble. Then there was the credit bubble. Now the real estate bubble. Next is the currency bubble aka government bubble. After that, nothing else remains to be inflated and Americans will have to face the music. The music, thanks to Obama and his decisions, will be a lot more painful than if this had been allowed to play out without interference and the liablilities purged. But don’t kid yourself, this is not a legacy of the Bush administration…it’s a legacy of recent US history in which many have been guilty or complicit. The difference with Argentina…actually there are a few, but the main one is that when Argentina went down, it didn’t drag the rest of the world down first. Currencies around the world are worse of than the greenback, because like it or not it is still the default currency…thanks Bretton-Woods. The other main difference is that Argentina is not surrounded by opportunistic enemies looking for the perfect opportunity to strike while it is weak. The US is battered and bruised, but the worst is yet to come. The economic catastrophe we are facing has only just begun, the stock market will continue to tank, oil prices will rise, the value of the dollar will fall (especially relative to gold) and at some point our Chinese bankers are going to close the cash window. When that happens, it’s curtains folks. Money and people are pouring out of the US economy and it’s getting scarier as tent cities are popping up across the land. Imagine what it will be like a year from now when things have continued to spiral out of control, incursions from Mexico are more and more frequent and deadly, Moscow starts flexing it’s muscles in Eastern Europe, Iran announces they are armed with a nuclear weapon, North Korea has successfully launched an ICBM capable of reaching Alaska or Hawaii…and then al Quaeda launches coordinated suicide bombing strikes in coffee shops across the nation. Just a thought. Having worked a bit in media and politics in Latin America I would caution not to be to taken in by propaganda such as this film. The film is very anti-freedom/capitalism and to an extent anti-democracy. throughout latin america, capitalism has been made synomimous with dictatorships, imperialism and corruption. And while in many cases that is exactly what happened, it does not automatically apply in all cases nor is it exactly the same in the US. On the other hand what I’m seeing today in the US seems almost like an intentional attempt to force the collapse of our economic system. yes, I said INTENTIONAL. The policies are so brain dead (both republican and democrat) that it almost appears as though someone is just trying to force a collapse in order to bring on a new form of government. And freedom, liberty and choice don’t appear to be in the cards laid out by whom ever is pulling the strings. The jews have indeed bought up huge, immense areas of land in Patagonia in case their gangster hideout in the “Middle East” collapses. In point of fact, the zionists do wish to put whites in concentration camps in the US and then kill all the rest. They’ve been pushing their slow motion coup along for decades and we’re seeing the end game now. The only thing stopping them and their lackeys from taking the gloves off is the fact that so many white Americans have guns and know how to use them. This contrasts with Israelis and their overrated army, equipped with the best weapons money stolen from American taxpayers can buy and then they still can’t beat anyone who shoots back with more than rocks, as their latest foray into Gaza proved. As Schwarzkopf’s adjutant said after Gulf War I, the IDF “… is a bunch of arrogant, overrated shits who wouldn’t last 15 minutes on a European battlefield.” In the end, after the big collapse and much unfortunate fighting in the US, the always lying tribe will be out looking for a new place to settle, new rubes to rob in order to pile high the shekels. But it won’t be in the US. It probably won’t be Argentina either. Why do you guys always have to pick on the Jews and think everything is “anit-white”. thats just crazy. are there racists in other races, religions and nationalities YES, but most people aren’t. Considering the logic of some of the posts, why would the “zionists” as you call them want to ruin their BEST ally? Isreal doesn’t really have anyone else but us when the chips are down. Ruining us, would be ruin for them – so those arguments don’t hold much water. The Fed Money Trust and its monopolistic capitalism is a Ponzi. In order to function, it depends on certain growth percentages in order to stay ahead of its debt generation. At some point, Trust swallows the wealth of the population because the people who are obligated to pay these promisary notes of interest bearing currency can not pay. So the bottom falls out of it. The Soviet was another type of Ponzi. It was also financed by Wall Street. In the Soviet, the oligarchy centralized all the wealth and doled out subsistance to the population after destroying the peasants and appropriating all their land. But the Soviet depended upon the support of the U.S. When the U.S. could no longer support the Soviet it collapsed. Both cartelized capitalism – the Fed Ponzi (1910) and the Soviet socialist Ponzi (1917) were set up by the Rothschilds through their agents the Rockefellers to exist in a symbiotic relationship. This relationship served the world devouring Agenda of a mere handful of banking families (who own Reserve banks) and their Dark Masters. This symbiosis also built the state of Israel. In the 1990s the bottom fell out of the Soviet Ponzi. Now the bottom is falling out of the Fed Ponzi. Dmitry Orlov lived through that collapse in Russia. And in his book Reinventing Collapse he gathered and expounded the lessons of the autodemolitions of these Ponzi economies. There are many lessons, analyses and extremely practical advices in this book – subtiteld “post Soviet lessons for a post American century”. Great practical advice on people live through the autodemolition of their national economy and reclaim their nation. Please think about this, Patriots. Thanks, “foundingfather1776,” for censoring my completely innocuous, fact-buttressed response to “rabbieric” and proving you are not worthy of your adopted title and lofty conceit. Wide awake and fooled no more…! Voir Dire….. whoa, hold on there…. What the hell are you talking about? There is one comment posted by you near the top of the list and now this last one. The only comments ever deleted are spam, most of which are done automatically by WordPress. If you tried to post something that did not appear, try to do so again – this thing called the “internet” is not exactly fool-proof. If your comment does not get through, then email me directly – foundingfather1776@gmail.com and I will post it for you. Before you go off the handle with false accusations of censorship, you might want to actually look at the comments section C-A-R-E-F-U-L-L-Y. Not only is your comment still there, but so are many others that express a similar sentiment. All sincere discussion and points of view are welcome here. The ultimate goal is for the TRUTH to be revealed to all. To “Voir Dire,” “draconianmeasures” and some others, for whatever reason, your comments were locked into the SPAM queue automatically by WordPress. These are legitimate comments and they were on-topic, so naturally I “freed” them from the queue. To my surprise, WordPress inserted them in the original order they would have been posted. I have never really bothered to check the spam queue in the past because….it is always filled with spam (get-rich quick schemes, genitalia enhancing products, etc). I guess I will have to start checking that regularly as legitimate comments seem to get trapped for some reason. I will state again quite clearly – I DO NOT CENSOR HERE! If someone has an issue about posting a comment, please contact me to resolve it. The very first comment is a big ole “FU” directed at your humble author. The comment is there for the world to see. You see, you have to have a very thick skin to publish the information that is covered here. But we publish the TRUTH and care not if some people can’t quite handle it. Thank-you for your comments and for helping me realize the WordPress spam filter is not 100% accurate. I extend my deepest apologies to you, and you are indeed a most worthy, contemporary patriot, Sir. Thank-you for reading my blog. are the way they are. When I discovered that there are some very bad people doing some very bad things; not just to my fellow Americans, but to my fellow human-beings all over the globe, I could not sit by silently any longer. I may be a tiny voice, but thankfully, there are millions more like me, and the mass of humanity is starting to wake up to the evils of Globalism, “The New World Order” false-flag terrorism, deliberately poisoned food and water, and a thousand other attacks the Illuminati/Banker/Global Elite crowd inflicts on humanity every day! Where ARE you? Please come back…! Can we debate FACTS, Rabbi? I will be expanding this data over the next several months. For now, have a look. I have presented this information for you to keep so that he next time someone calls you an anti-Semite for saying Jews run the world’s banking system, you can back up your claims with facts. I will be compiling similar data regarding the media, corporate America, academia, Washington and other centers of Jewish power. In the 1944 Bretton Woods Conference, the World Bank and IMF were created. While both are international organizations, they are headquartered in Washington DC. The World Bank is led by Americans while the IMF is led by Europeans. International Monetary Fund (IMF) is a Jewish -run bank designed to take over the political power and societal norms of nations in financial distress. Although it claims to be an international fund, it is really an extension of Washington. The current president of the IMF is Dominique Strauss-Kahn, a Jew. Wall Street was formerly controlled largely by the Italian mafia decades ago, although there was still a significant but less conspicuous control by Jews. Over the most recent decades, Italians have been pushed out, retired and replaced with Zionist Jewish mafia. Roy A. Young (October 4, 1927 – August 31, 1930) ? G. William Miller (March 8, 1978 – August 6, 1979) ? Atlanta: Dennis P. Lockhart – ? Among the 12 Federal Reserve District Banks, the New York Federal Reserve Bank is the one with all of the power. Maybe put the percentage in the subtopic? Not that I agree with you or anything, just that it would make the data easier to compare. @FF, it looks like you used to have quite a few followers/readers, I wonder if they all closed their eyes and veered off since you have been discussing the chemtrail issue, or are they simply silent readers? Americans do simple math, Psft, that’s far too too much to expect of us. But who knows? Could just as easy be the influence of the Kenites. Are There Still Differences Between the Great Powers? “Maybe put the percentage in the subtopic? To their everlasting credit, writers’ “Zog” and “Zsiadozas” already did the math though please note it was compiled about a year ago and needs updating such as the Federal Reserve Board of Governors with three newer additions – Jews ALL. CHANGE HAS NOT COME TO AMERICA, NOT WITH YET ANOTHER JEW INFESTED PRESIDENTIAL ADMINISTRATION AT THE HELM OF THE USA. It had to be pretty difficult to put together a more Judaized presidential administration than even Bill Clinton, but Obama has managed to do so. But then again, many of Obama’s Cabinet and personnel picks are little more than a repeat of the Clinton Administration. As most astute observers and researchers now well know, the two major political parties don’t matter much these days because the Jewish plutocrats, Jewish political machine, Jewish mass-media complex, and Jewish legal complex has both of them almost entirely locked down. I estimate that at least 1/5-1/3 of Obama’s Cabinet plus important personnel posts are of ethnic Jewish ancestry, and that is probably a fairly low estimate. If one counts all of the aides, assistants, assistants of assistants, deputies, backups, right-hand (wo)men, lawyers, advisers, and other high to mid-level bureaucrats the number of ethnic Jews in the Obama Administration might actually be closer to 40-50% as in some recent administrations, as these aides and assistants are the individuals who often wield the real power because they do so much of the real work behind the scenes, far away from the glaring cameras of the (disproportionately Jewish) presscorp. Other ostensibly non-Jewish Cabinet and personnel members no doubt married a Jew (which is common amongst the American political class: Washington DC-Northern Virginia-Maryland is an extremely Jewish region) or have partial Jewish ancestry which no one is publicly aware of. Keep in mind that Jews as an ethnic group in America are only about 2-3% of the overall population, yet still they are over-represented by a massively disproportionate margin in the Obama Administration, especially in the most important posts dealing with economic issues (which is noted). And as every U.S. citizen now realizes, economic issues are particularly critical at this juncture in American history – in short, the country is on the brink of insolvency. Knowing this, how good does it make you feel that the group in charge of America’s national finance, and thus the country’s overall economic destiny, are a group of people who are very well known to be (both historically and in modern times) completely and utterly manipulative, deceptive, and corrupt when dealing in financial matters? Well, that covers many of the top slots in the Obama Administration. There are of course many slots filled by African Americans, Hispanic Americans, and Asian Americans, yet for whatever reason Jewish Americans made it in to nearly all of the top slots despite the fact that, again, they are a much smaller ethnic minority than any of the aforementioned groups. But what about the non-Jewish European White Americans, the Euro-American Whites who are genetically and culturally very much different than and separate from Jews (who are mistakenly perceived as part of the overall White majority in America when they definitely are not)…how did the Euro-American White majority fare in the overall Cabinet selection process? Hmmm, not too well…as you can quite easily find out fromthis table, they are relegated to the lowest Cabinet posts, many of them of tertiary importance – yes, the non-Jewish, non-Hispanic White ethnic majority which still comprises over 60% of the American populace barely holds a total of 25% of the Cabinet slots, and the ones they do hold have historically been rather unimportant and even downright secretarial. So why are non-Jewish European American Whites no longer being represented at the upper levels of the Federal government of the United States? What happened? Has something changed in the last two to three decades? If you know of any people that I’ve missed here (because I’m sure there are plenty more), let me know by leaving a comment and I’ll add them. Of the eleven(11) top officials in the U.S. Treasury Department, six(6) are Jews. This is a numerical representation of 55%. Jews are approximately 2% of the United States population. This means that Jews are over-represented among the top officials of the U.S. Treasury Department by a factor of 27.5 times, or 2,750 percent. This extreme numerical over-representation of Jews among the top officials of the U.S. Treasury Department cannot be explained away as a coincidence or as the result of mere random chance. You must ask yourself how such an incredibly small and extremely unrepresentative minority ethnic group that only represents 2% of the American population could so completely dominate the highest levels of the U.S. Treasury Department. Who Controls U.S. Treasury Secretary Timothy Geithner? Of the six(6) counselors to U.S. Treasury Secretary Timothy Geithner, five(5) are Jews. This is a numerical representation of 83%. Jews are approximately 2% of the United States population. This means that Jews are over-represented among the counselors to U.S. Treasury Secretary Timothy Geithner by a factor of 41.5 times, or 4,150 percent. This extreme numerical over-representation of Jews among the counselors to U.S. Treasury Secretary Timothy Geithner cannot be explained away as a coincidence or as the result of mere random chance. You must ask yourself how such an incredibly small and extremely unrepresentative minority ethnic group that only represents 2% of the American population could so completely dominate the inner advisory circle of U.S. Treasury Secretary Timothy Geithner. Who Controls the United States Economy? Robert Greifeld(Jew) – Chief Executive Officer, NASDAQ OMX Group, Inc.
Lloyd C. Blankfein(Jew) – Chairman and Chief Executive Officer, Goldman Sachs Group, Inc.
Jews are approximately 2% of the United States population. The probability that the heads of all of these organizations would be Jews is infinitesimally small. This extreme numerical over-representation of Jews cannot be explained away as a coincidence or as the result of mere random chance. You must ask yourself how such an incredibly small and extremely unrepresentative minority ethnic group that only represents 2% of the American population could so dominate all of these important and influential private and U.S. Government institutions. Of the nine(9) Goldman Sachs executive officers, six(6) are Jews. This is a numerical representation of 67%. Of the twelve(12) members of the Goldman Sachs board of directors, seven(7) are Jews or have Jewish spouses. This is a numerical representation of 58%. Of the twenty-nine(29) members of the Goldman Sachs management committee, seventeen(17) are Jews. This is a numerical representation of 59%. Jews are approximately 2% of the United States population. This means that Jews are over-represented among the Goldman Sachs executive officers by a factor of 33.5 times, or 3,350 percent, over-represented on the Goldman Sachs board of directors by a factor of 29 times, or 2,900 percent, and over-represented on the Goldman Sachs management committee by a factor of 29.5 times, or 2,950 percent. Of the president and the forty(40) members of the Council on Foreign Relations board of directors, twenty-four(24) are Jews or have Jewish spouses. This is a numerical representation of 60%. Jews are approximately 2% of the United States population. This means that Jews are over-represented on the Council on Foreign Relations board of directors by a factor of 30 times, or 3,000 percent. This extreme numerical over-representation of Jews on the Council on Foreign Relations board of directors cannot be explained away as a coincidence or as the result of mere random chance. You must ask yourself how such an incredibly small and extremely unrepresentative minority ethnic group that only represents 2% of the American population could so dominate this important and influential think tank. Roger C. Altman(Jew) – Chairman, Evercore Partners Inc.
Henry A. Kissinger(Jew) – Chairman, Kissinger Associates, Inc.
Marie-Josee Kravis(Jew) – Senior Fellow, Hudson Institute, Inc.
Of the twenty-six(26) Americans who attended the 2009 Bilderberg conference, eighteen(18) are Jews. This is a numerical representation of 69%. Jews are approximately 2% of the United States population. This means that Jews are over-represented among the American attendees of the 2009 Bilderberg conference by a factor of 34.5 times, or 3,450 percent. This extreme numerical over-representation of Jews among the American attendees of the 2009 Bilderberg conference cannot be explained away as a coincidence or as the result of mere random chance. You must ask yourself how such an incredibly small and extremely unrepresentative minority ethnic group that only represents 2% of the United States population could so dominate this important and influential international conference. P.S. Bernanke’s appointment to the Fed is for FOURTEEN years, giving him and his cronies plenty of time to pick clean our pockets. There’s seven seats on the Federal Reserve Board of Governors, but only five are filled and four of those by Jews. Ever hear anything about that lop-sided cabinet in the MSM? If someone with a Muslim sounding name was nominated to be on the board, do you think the MSM would cover that story, not that anyone with a name anywhere close to sounding Muslim would be nominated. Janet Napolitano, the newly “appointed” head of the totalitarian “Department of Homeland Security”, is Jewish. Jews’ are always put in key positions, particularly in regards to economic/monetary policy (vehicles for perpetual fleecing/indebtedness/slavery), taxation (the means by which they pick our pockets) and apparently now too the agency responsible for our unfurling police state (as previously noted in another post, out with the he-devil Chertoff; in with the she-devil Jew Shrew Napolitano). I’m not sure if you were aware that Big Sis, Janet Napolitano, is also Jewish, but she is. She, of course, bankrupted Arizona as their Governor as an open-borders fanatic, and all but handed the Reconquistas the keys to the state. She is also good buddies with police-state legislation sponsor, and traitor, Democrat Rep. Jane Harman, who arranged to let the two AIPAC Israeli spies off the hook. Those who fail to learn from history’s mistakes will be condemned to repeating them. Argentina and Greece are perfect recent examples of what is heading down the pike. The US and World monetary policy is wreckless and politically driven to maintain the image of stability and we will all pay for our passivity and naivete.